On June 2nd 2016, the Obama Administration finalized tough new rules to stop the trade of ivory in the United States. Thanks to people like you, we’re a step closer to banning ivory worldwide. Reduce demand for endangered species and their products. Language under review for the National Defense Authorization Act would help law enforcement and conservation for species. Sign below, and we’ll send your support. Thanks for Acting. Now Join SAM. Ever wonder what happens to a pledge after you sign it? Now you don't have to. SAM tracks, measures, and calculates your impact over time by connecting sites you use. Take your action further and create a username now. Thanks for doing your part and amplifying your voice with SAM. We’re currently still in beta, so we’ll notify you when you can set up your profile and start seeing these actions within the SAM network. 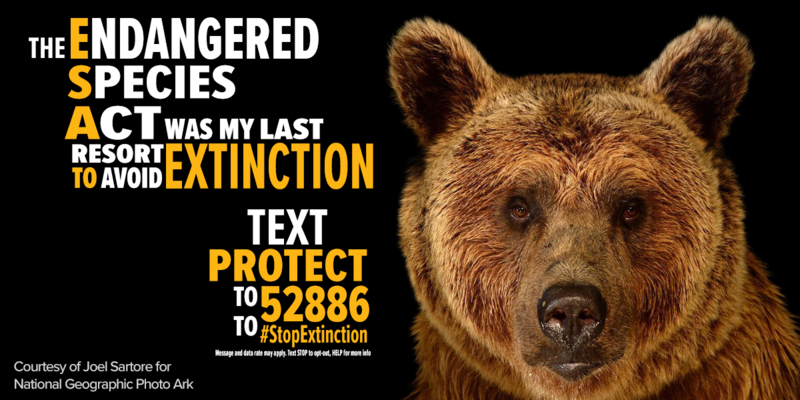 The Endangered Species Act is one of the strongest, most effective wildlife protection laws in the world. It has prevented the extinction of 99 percent of species that have been protected under its care, including American icons like the bald eagle, California condor and Florida manatee. But, members of Congress are moving forward a series of bills that would gut protections for endangered and threatened wildlife and their habitat under the Act. Even small actions when taken together can have a major impact. Sign up for a challenge today and join the movement. Washington state bans endangered animal trade. In Racing Extinction, a team of artists and activists exposes the hidden world of extinction with never-before-seen images that will change the way we see the planet. Two worlds drive extinction across the globe, potentially resulting in the loss of half of all species. The international wildlife trade creates bogus markets at the expense of creatures that have survived on this planet for millions of years. And the other surrounds us, hiding in plain sight — a world that the oil and gas companies don’t want the rest of us to see. Using covert tactics and state-of-the-art technology, the Racing Extinction team exposes these two worlds in an inspiring affirmation to preserve life as we know it. From the Academy Award® Winning Filmmakers of "The Cove"
Show the world you are Racing Extinction. Support the village of Lamakera by lighting a candle. Purchase the Manta Ray candle holder from Glassy Baby and 10% of the sale will be donated to WildAid to support the small village of Lamakera in Indonesia. After the ‪#RacingExtinction‬ premiere, 24,000+ people immediately took climate action, demanding progress from leaders of the world’s 5 largest carbon emitters. Your voice was heard as leaders agreed to an historic agreement on reducing dangerous emissions. Join us now so we can keep the pressure on! Visit the Shop to support the cause. Show the world you’re Racing Extinction with a Racing Extinction t-shirt and support the filmmakers. Together we can win the race. Poaching, illegal animal trafficking and overconsumption are bringing precious species to the brink. The time is now for world leaders to act – and for all of us to speak up. Thank the President for stepping up to protect endangered species and ask him to finalize the Administration's proposed rule to stop the commercial ivory trade in the United States. Poachers have killed more than 100,000 elephants in the last three years and we are running out of time. Please act now and show your support. In order to cast a light species extinction, the Racing Extinction team turned a standard Tesla Model S into a “mobile projection vehicle.” Take a behind the scenes look at all the car's special features. Miss the broadcast? No problem. You can still see the film on demand.